The upcoming EU Gateway | Business Avenues business mission in Healthcare & Medical Technologies will bring selected companies to Singapore and the Philippines from 28 August to 4 September 2018. This business mission week will include pre-arranged business-to-business meetings, a networking reception. 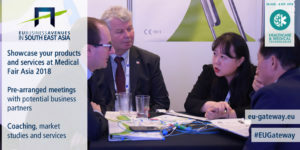 Selected European companies will also participate in the Medical Fair Asia, the perfect platform to discover the latest industry innovations, network, and do business.